Tuna Barley Salad, easy dinner recipes. This is a variation on the traditional Tuna Macaroni Salad. It's lots healthier and we like the chewy barley.... Use quick-cooking pearl barley, which takes about 15 minutes. Cook eggs. When done, cool, peel and roughly chop. Thaw peas by running under hot water; drain well. Put all ingredients into a bowl and stir well to combine. 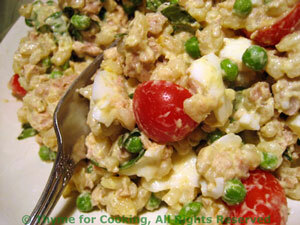 Add tuna, eggs, peas, tomatoes, celery, herbs, dressing and stir well to combine. Your choice - peaches, watermelon, maybe?